The issue between the Railwaymen’s Union of Malaya (RUM) and the management of KTM Berhad following the sacking of two top union officials will be taken to the prime minister, The Star reported today. KTM non-executive chairman Datuk Nawawi Ahmad (pic) told the daily that he would raise the issue with Datuk Seri Najib Razak when the latter visits Langkawi on September 14. “I know the problem. I will be meeting the union and president separately," Nawawi, who is also Langkawi MP, was quoted as saying. “I will bring up the issue with the prime minister, who will be visiting Langkawi on September 14." The Malaysian Insider had reported on Wednesday that KTMB had sacked two union leaders – president Abdul Razak Md Hassan and his deputy, R. Subramaniam – while another 110 are awaiting their fate after taking part in a picket on May 9. 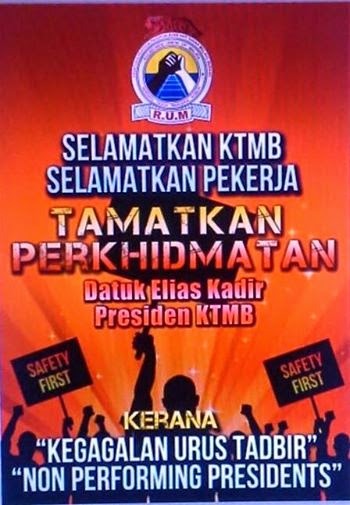 The picket was held to pressure KTMB president Datuk Elias Kadir to step down. About 700 RUM members had participated in the protest. Nawawi told The Star that he has been asked to resolve the issue, adding that the two leaders could possibly get a reprieve. “I was given the mandate by the KTM board last week to resolve this issue," he was reported as saying. He added that there have been disputes between the union and the president even before he was appointed to his position in February. He was also reported as saying that the termination letters would only take effect on September 29, which meant that both union leaders were still with KTMB. 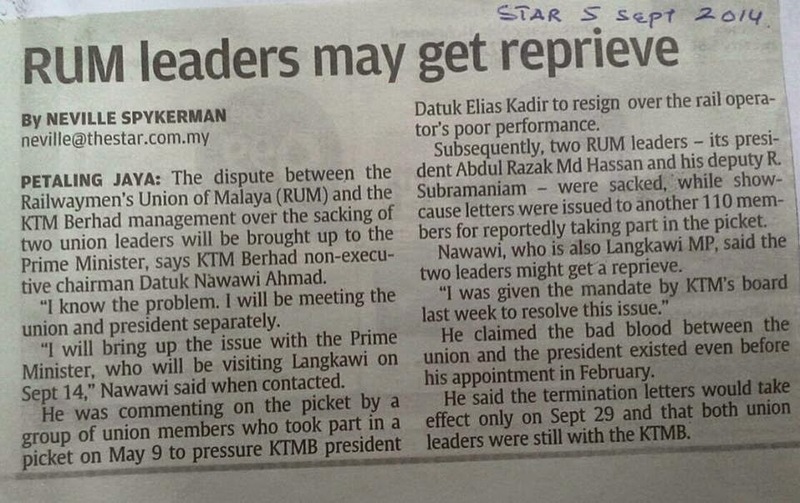 Razak had told The Malaysian Insider that that they received their termination letters from KTMB last Friday. "We were informed that our services were no longer required and our termination was with immediate effect," Razak had said.